NCERT Solutions for Class 10 English Chapter 11 The Rime Of The Ancient Mariner are provided here with simple step-by-step explanations. These solutions for The Rime Of The Ancient Mariner are extremely popular among class 10 students for English The Rime Of The Ancient Mariner Solutions come handy for quickly completing your homework and preparing for exams. All questions and answers from the NCERT Book of class 10 English Chapter 11 are provided here for you for free. You will also love the ad-free experience on Meritnation’s NCERT Solutions. All NCERT Solutions for class 10 English are prepared by experts and are 100% accurate. What can you see in the picture? Does the man look happy? There is a distressed man standing in the company of a few other men, who seem to be on board a ship. The man, definitely, doesn’t look happy. He seems to be deep in sorrow, because his neck is hung low and his hand slapped on his forehead. Why does he have the bird hanging around his neck? The bird hanging around his neck might symbolize the memory of his committing a terrible error. c. Something that is with you all the time as a reminder that you have done something wrong? c. Something that is with you all the time as a reminder that you have done something wrong. They are large oceanic bird who have long narrow wings and are noted for a powerful gliding flight. The sailor held him with his skinny hand and said: “There was a ship.” The wedding guest, disgustingly said, “Let go of me, you lunatic person,” and dropped his hand. However, the sailor captivated his attention with his glittering eye; the wedding guest stood still. He was all ears to the old sailor, just like a three years old child, because now the mariner had his will. The wedding guest was left with no choice but to listen to the ancient sailor. Thus began the narration of the ancient mariner. “There was a loud cheer on board, and the harbor has clear, for the sun to rise above the church, the hill, the lighthouse. The Wedding Guest beat his breast in impatience because he could hear the loud musical instrument being played. The bride had started walking down the hall. She was as red as the rose. Before her went a merry procession of singers and musicians. The wedding guest didn’t have a choice but to hear. Thus continued the mariner: “Then came the storm, severe and strong. The storm overtook them, and chased the ship southwards. The cruel torturous ways of the storm is described here. The storm blew harsh, yelled and chased them towards south. The ship’s steer hung low. They witnessed both mist and snow. The weather became wondrous cold with ice everywhere as bright and clear as emerald. The floating ice and steep sides of the ice-bergs formed a dismayed sheen, that is, a smooth bright surface of ice. There was ice all around them. The ice cracked, growled, roared and howled, like noises of a person in a fainting fit. Then, the albatross arrived through the fog. It was hailed in God’s name, as a Christian soul. It ate the food it had never eaten and flew round the ship. Then, a miracle occurred, when the ice cracked and the helmsman could steer the ship through the ice. Part 1 of the poem concludes with the ancient mariner possessing an ill omen about the albatross. This part of the narration gave the ancient mariner a troubled look. When asked the reason for the same by the wedding guest, the mariner let it out and revealed the terrible truth that he shot the albatross. 'God save thee, ancient Mariner, /From the fiends that plague thee thus!- Why look'st thou so?' means………. ii. the albatross would appear at a fixed time everyday. ii. the albatross would appear at a fixed time every day. iii. the ship was pushed out of the land of mist and the ice melted. iv. the albatross started playing with the mariners and ate the food they offered. The sailors were happy to see the albatross because……..
ii. it split the icebergs around the ship and helped the ship move forward. iii. it was a messenger from God and it lifted the fog and mist. iv. it gave them hope of survival by splitting the icebergs. The storm blast has been described as being tyrannous because………. iii. the sound of the bassoon meant that the bride had arrived and the wedding ceremony was about to begin and he could not attend it. 'The sun came up upon the left, /Out of the sea came he;'This line tells us that the ship…………………. The wedding guest remarked that he was 'next of kin' which means that ……..
iii. he wanted him to listen to his story. What was the terrible deed done by the Mariner? Why do you think he did it? The terrible deed done by the Mariner was that he shot the albatross. I think he did it because he considered its presence to be a bad omen. How do we know that the albatross was not afraid of the humans? Why did the sailors hail it in God’s name? It can be said for sure that the albatross didn’t fear humans because it followed the mariners day and night and ate and played with them as well. The sailors hailed it in God’s name because it was a messenger from God which lifted the fog and mist. How does the mariner express the fact that the ship was completely surrounded by icebergs? The words “the ice was here, the ice was there, the ice was all around,” gives us the picture of the ship surrounded, or rather, caught completely by the icebergs. How did the sailors reach the land of mist and snow? The sailors were caught amidst a huge severe storm. This fierce storm chased their ship southwards. The masts started to stoop down and the front of the ship dipped low, indicating the loss of control of the ship, in the hands of the storm. What kind of weather did the sailors enjoy at the beginning of their journey? How has it been expressed in the poem? The beginning of the journey witnessed very nice and favourable weather conditions. The sun rose bright and shone bright on the mast a noon.. Things like the church, the hill and the lighthouse top signify life, society and human lives, which becomes a bleak idea soon in the later part of the poem. How does the mariner describe the movement of the ship as it sails away from the land? The mariner described the movement of the ship as it sailed away from the land in a very animated and interesting way. His description was so realistic that the wedding guest was mesmerised. As the ship moved southward, the weather was pleasant. But soon the weather started changing for the worst. First, a storm broke. It later turned to mist and snow, due to which their ship was stuck in ice. The poem’s protagonist, he is unnaturally old, with skinny, deeply-tanned limbs and a “glittering eye.”He sets sail from his native country with two hundred other men who are all saved from a strange, icy patch of ocean when they are kind to an Albatross that lives there. Impulsively and inexplicably, he shoots the Albatross with his crossbow and is punished for his crime by a spirit who loved the Albatross. He is cursed to be haunted indefinitely by his dead shipmates, and to be compelled to tell the tale of his downfall at random times. Each time he is compelled to share his story with someone, he feels a physical agony that decreases only temporarily once he finishes telling the tale. Was the wedding guest happy to be stopped? Give reasons for your answer. The wedding guest was extremely displeased to be stopped. This statement can be justified by taking instances from the poem where he tries to shrug off his hand, in order to proceed towards the wedding ceremony. His impatience is also noticed when he says he is one of the next family members who should be present in the wedding However, the ancient mariner holds him with his “glittering” eyes, forcing him to listen to the story.. The wedding guest started beating his breast as well, in between the narration, hearing the sounds of large instruments being played. How did the ancient mariner stop the wedding guest? The ancient mariner held the wedding guest with his skinny hand, and forced him into listening to him, capturing his attention with his glittering eyes. His gaze was so strong and intense, that even though the wedding guest did not want to listen to the story, he was forced to, much against his will. There are a number of literary device used in the poem. Some of them have been listed below. Choose the right ones and write them down in the table as shown in the example. In each of the cases explain what they mean. Hyperbole; the extremity of brutality of the storm is portrayed. Repetition; the word ‘ice’ is repeated several times in the reference. In groups of four discuss what you think happens next in the poem. Share your views with the rest of the class. Note: This question is to be answered on the basis of your own understanding, experience and thoughts. It is strongly recommended that you prepare the solution on your own. However, a few pointers for discussion have been provided for your reference. Why did the mariners hang the albatross around the neck of the Ancient Mariner? 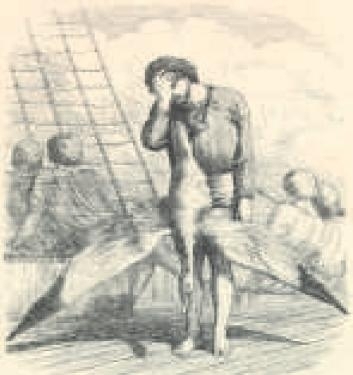 The mariners hung the albatross around the neck of the Ancient Mariner as a cursed reminder, so that the thought could plague him for the rest of his life. Describe the condition of the mariners as expressed in the thirteenth stanza. What or who did the mariners feel was responsible for their suffering? The mariners feel the absence of the albatross is the reason for their suffering. Thus, they blame the ancient mariner for killing the albatross. What is the narrator trying to convey through the description of the situation in the tenth and eleventh stanza? In these stanzas, the narrator tries to convey the standstill description of the ocean and the ship. Everything rot because of the motionless sea. Animals from deep within the ocean had come out of their places and crawled in the slimy sea. At night, the 'death-fires' seemed to dance near them. The narrator refers to the sea water as the witch's oil. Just like a witch's oil has many shades and keeps boiling, the sea water also had 'green, blue and white' colours. However, this was due to the different coloured creatures crawling in the sea. What is the irony in the ninth stanza? Explain it in your own words. The stanza “Water, water, everywhere,/And all the boards did shrink;/Water, water, everywhere,/Nor any drop to drink,” explains the irony as to how the presence of water in abundance is of no use to the sailors. The water of the ocean is salty, and thus inappropriate for the sailors to quench their thirst. How does the mariner describe the fact that they were completely motionless in the middle of the sea? The stanza “Day after day, day after day,/We stuck, nor breath nor motion;/As idle as a painted ship/Upon a painted ocean,” portrays a still picture of the sea and the ship. What is indicated by the line 'The bloody sun, at noon,/Right up above the mast did stand,/No bigger than the moon'? This line indicates the excessive heat of the sun, which shone above the mast at noon. The word ‘bloody’ shows how unwelcome the sun was. How did the sailing conditions change after the ship had moved out of the land of mist and snow? What or who did the mariners blame for this change? The breeze dropped down, making the sails drop down as well. The ship came to a standstill. The mariners blamed the ancient mariner for this change because he had killed the albatross which brought the breeze. How did the other mariners behave towards the Ancient Mariner at first? How many times did they change their mind about the Ancient Mariner? What does this tell us about their character? The other mariners rebuked him at first to have killed the albatross. However, they changed their mind immediately after that to praise the ancient mariner who killed the bird which brought in fog and mist. This shows how confused the mariners were, to set up a fixed notion about the ancient sailor. Why does the mariner say that 'no sweet bird did follow'? The mariner says that no sweet bird did follow with reference to the albatross which followed them a few days back, and now is dead. In which direction did the ship start moving? How can you say? Like part one, the second part also has a number of literary devices. List them out in the same way as you had done in question number seven and explain them. “The Rime of the Ancient Mariner” is written in loose, short ballad stanzas usually either four or six lines long but, occasionally, as many as nine lines long. The meter is also somewhat loose, but odd lines are generally tetrameter, while even lines are generally trimeter. (There are exceptions: In a five-line stanza, for instance, lines one, three, and four are likely to have four accented syllables—tetrameter—while lines two and five have three accented syllables.) The rhymes generally alternate in an ABAB or ABABAB scheme, though again there are many exceptions; the nine-line stanza in Part III, for instance, rhymes AABCCBDDB. Many stanzas include couplets in this way—five-line stanzas, for example, are rhymed ABCCB, often with an internal rhyme in the first line, or ABAAB, without the internal rhyme. Find examples of the use of interesting sounds from the poem and explain their effect on the reader. Cnomatopoeic words which give a smooth picture of the breeze blowing. This word exclaims the terror and the horror with which the miserable condition of the sailors is expressed.